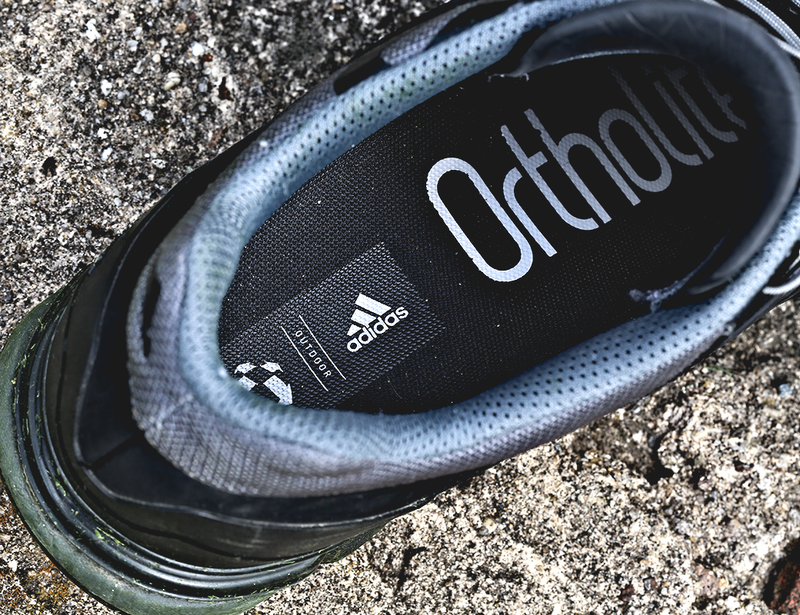 Per the manufacturer's description: Full forefoot adiprene for forefoot propulsion and efficiency Inlay: Molded Ortholite sockliner Midsole: Outdoor specific Formotion unit for enhanced motion control and downhill comfort Outsole: Traxion-featuring Continental rubber for extraordinary grip. This is the non-Gortex version of the Fast R shoe, comes in at about a weight of 13oz. I paid retail price from Amazon in July of 2016. I have worn them every day since EDC (even in the snow, on purpose) until I purchased their replacements, the Salomon Speedcross 4's which I recently posted about. 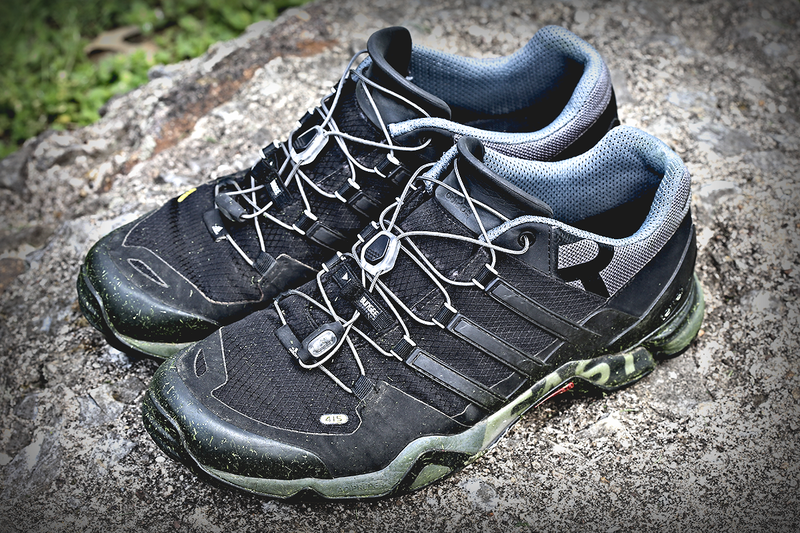 I went through two pairs of Salomon Speedcross 3 's, both the regular and CS (Gortex) version - read the review of both here. For the summer/warm months, I prefer a low cut "active" type shoe which is more aggressive in nature than not. I am not a Van's type shoe wearer, my shoes need to have a very specific function and utility. I do not generally care for aesthetic other than my duty requirements. Thankfully that is mostly a non-issue as most companies will produce a black/black or black/grey shoe as these Fast R's are colored in. I decided to get away from Salomon when I saw adidas release their Fast R shoe. It really looked like a different version of the Speedcross and I figured it would be good to go based on its appearance. I did look at other companies like Lowa and Salewa running shoes, they did not speak out to me and having friends who have tried both then moved back to Salomon. The Fast R shoe is well made. There is a very obvious to detail which becomes clear with some things which at first glance you may disregard being "cool" but then after a good amount of use you realize that it is a really good idea. 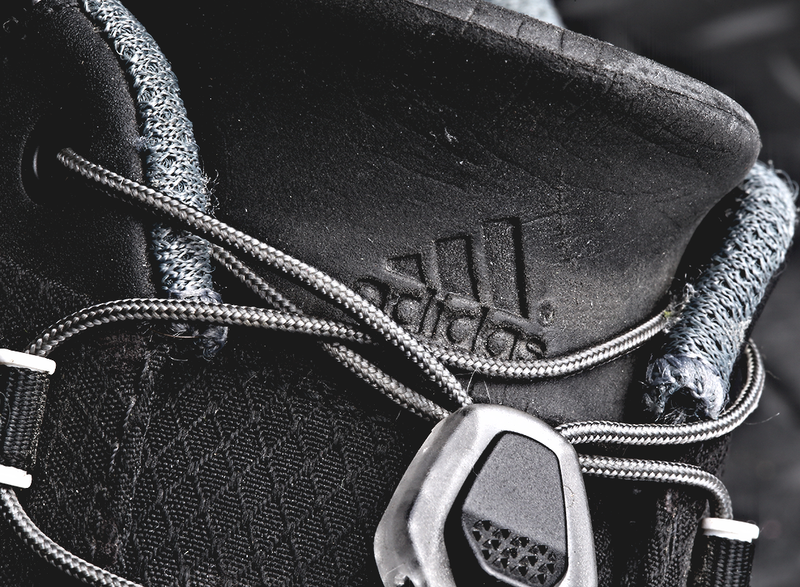 The Fast R's come with Ortholite soles with the adidas stamp on them. All of my Salomons came with the same sole and I am comfortable with it. It does have a very short break-in period regardless of what is said, you will need to wear an Ortholite sole for about two or three days in order to properly feel comfortable with them. 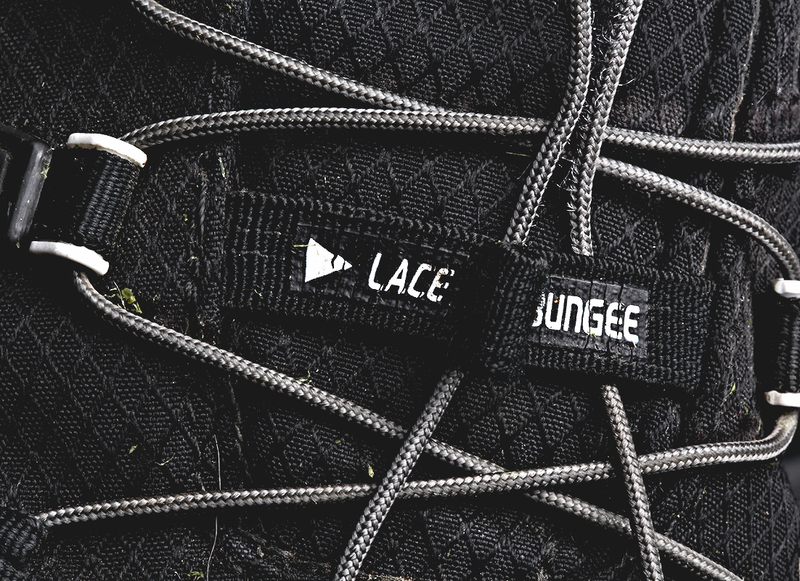 There is a lace bungee retention system which was in place to keep the quick lace system from moving around. 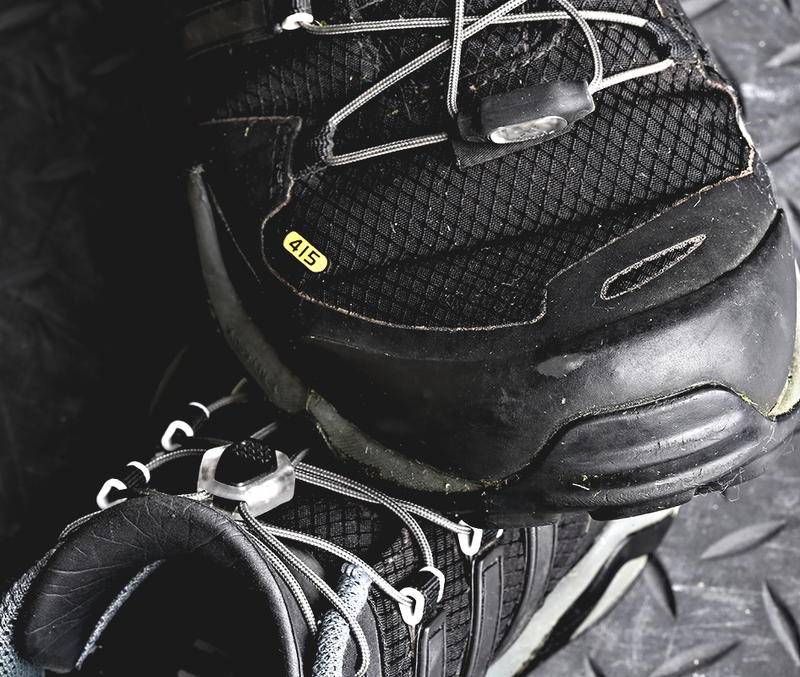 The quick lace pull tab is the reverse of the Salomon tab, which means that you push the black tab forward and then move the system back to tighten it, then doing the reverse to loosen it. 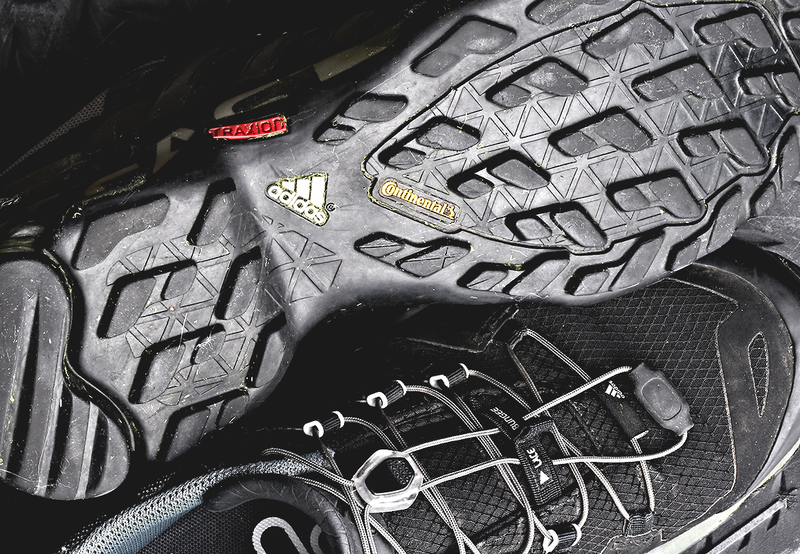 The Salomon system does not have a pull tab and just allows free movement with pressure. 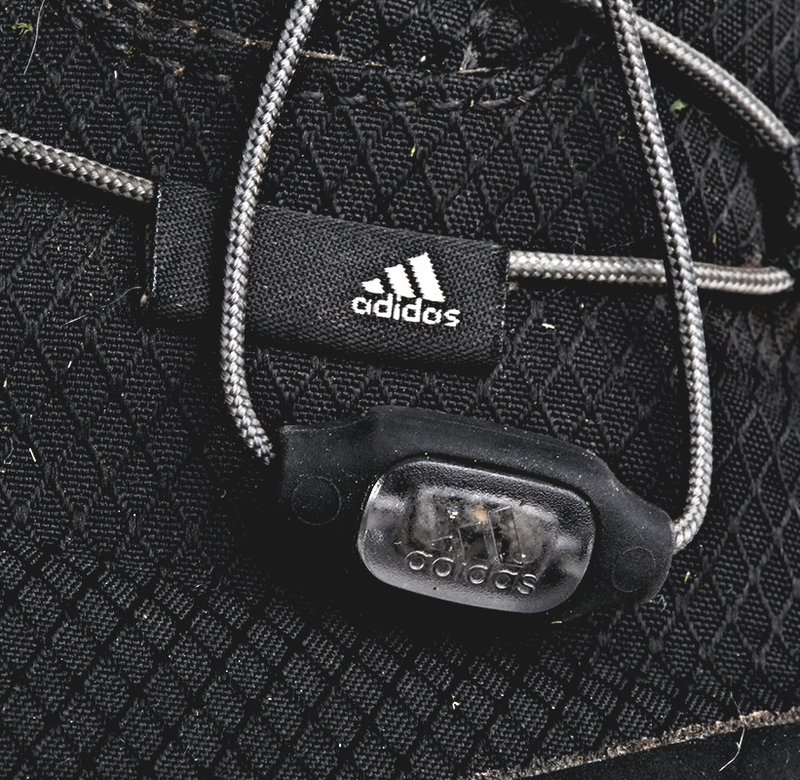 The end of the quick lace system allows you to get a full grip on the laces to pull them, there is no retention system for this end piece. The toe is hard rubber. Not hard enough to stop a hammer from hurting if it falls on your toes, but hard enough that if you are running and you kick a large rock, tree stump or vehicle it will protect your toes. The mesh material used for the body is very breathable is not waterproof or water resistant. It allows a good bit of air movement. The tread of the Fast R's does not really look worn at all. 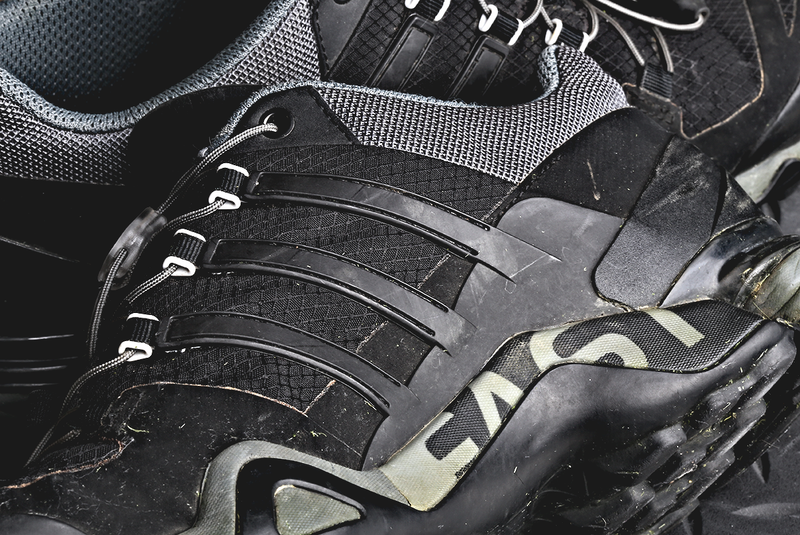 This is very interesting to me because my experience with the Salomon Speedcross shoes was that the tread quickly deteriorates. After doing some research it became clear that the Continental logo was not just a gimmick. 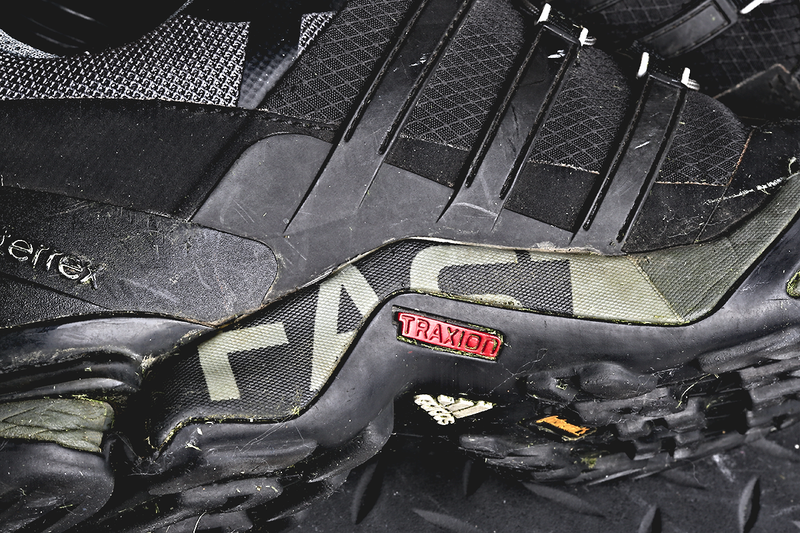 Adidas teamed up with Continental Rubber in order to create a proprietary mixture for the tread, while utilizing something they called TRAXION which is the optimal outsole lug pattern design for a certain outdoor activity. The Fast R's appeared (to me at least) to have the same heel drop as the Speedcross 3's, which is around 9mm. That is a normal drop amount, and usually chosen by companies in order to cover many bases for active shoes like the Fast R's. I quickly discovered that these are directly on par with the Salomon Speedcross 3's in terms of wet / rain performance. They stick to the ground, even concrete well enough to not skip a beat and have very little to no loss of traction or contact. I did several rain runs with them and have no complaints in this field on a mix of concrete and off-road type terrain. Different socks do not make an impact in the level of comfort or performance of the Fast R shoe. I wore everything from low cut running socks to thick wool winter socks and did not experience a single issue which could be from the different sock sizes. The shoes worked well in most applications, they do not appear as aggressively as the Salomon Speedcross shoes and this specific color tone matched with most of what I wear. The biggest issue is the lack of quick lace retention. These would instantly be my "go to" aggressive EDC shoe if it was not for the complete lack of common sense (or experience/understanding) exhibited by whoever designed the quicklace system. 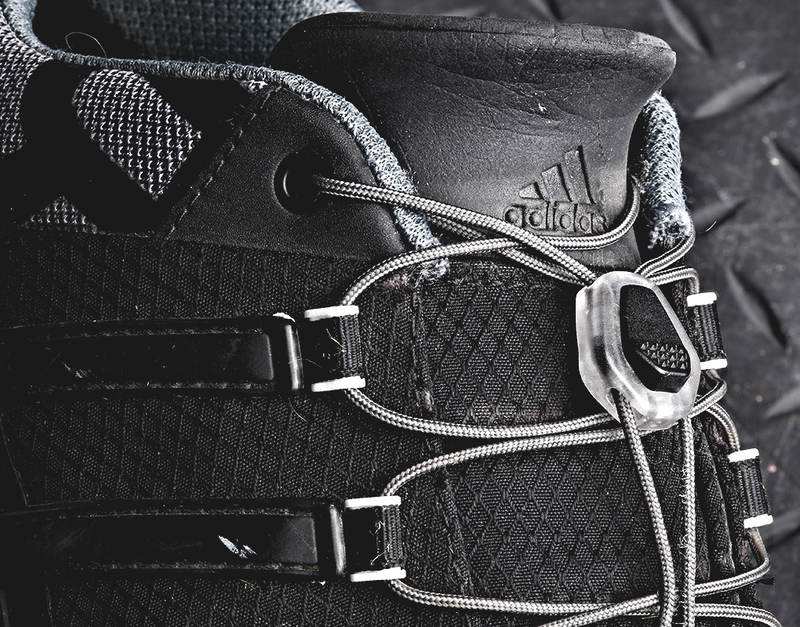 I have no doubt that someone in adidas showed a photo of the Salomon Speedcross and it showed the quick lace system being held in place by the bottom most retaining lace, they figured this is a cool/hip fashion thing and decided to do completely away with the whole quick lace retainment system, they just added a single piece of bungee material to hold it in place. It does not work well and is absolutely a no go for anyone who does anything other than simple running around their neighborhood. At the price point they released the Fast R's at, it was meant to be a direct competitor for the Speedcross market segment and while there is probably a large segment of people who use the shoe for its intended purpose of trail running, some of us bought them for EDC as we like the feel and on demand performance of these types of shoes in the warm months. I have snagged the quick lace system a few times on various things, one time on the charging cable in my vehicle in a crazy turn of events and nearly fell over. It is really amazing how many things there are to snag laces against your feet when you are going about your regular day. If you are one of the people who likes to leave their laces out like this while wearing Salomon shoes, please stop. There is a pocket for the quick lace system at the top of the tongue and it fits really well. The fact adidas missed this or simply did not care enough to make it work properly is a huge setback for me personally. 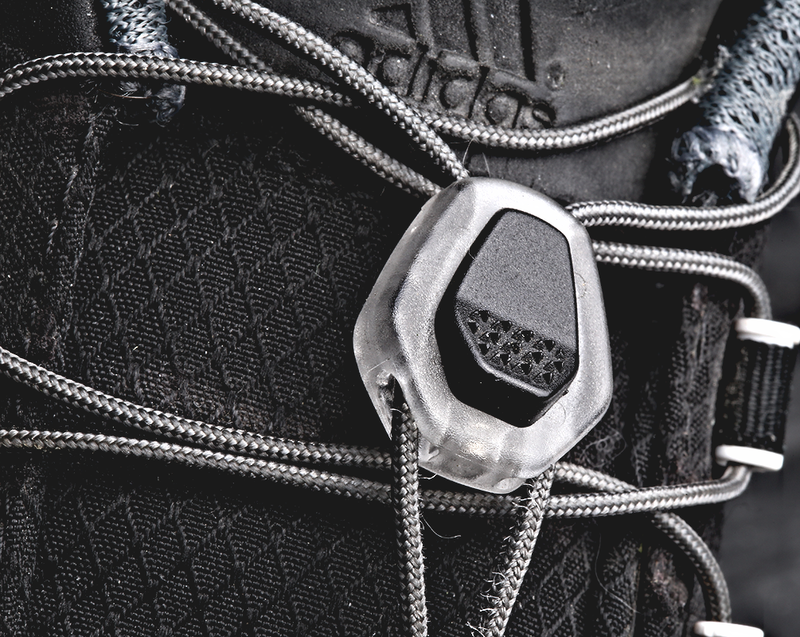 The entire design of the quick lace system including the push button lace retention was poorly thought of. It is not intuitive and simple as the Salomon system. There is just no reason you should be required to push a button forward and then pull the system back to tighten it. Maybe adidas wanted to be "different" and in this case that surely does not mean better. 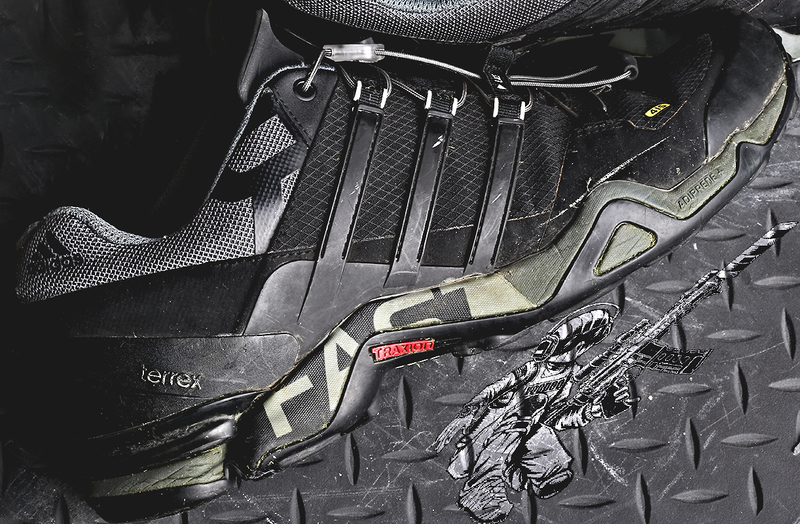 If you took the quick lace retention system from the Salomon shoes and added it to this shoe (and other adidas terrex shoes) I would probably be very close to switching over because the rubber tread is, as advertised, a good 30% better than most competitors and probably in the 10-15% better than comparable Salomon shoes. A few small things which I would also change are the yellow colored tags and all the adidas logos. 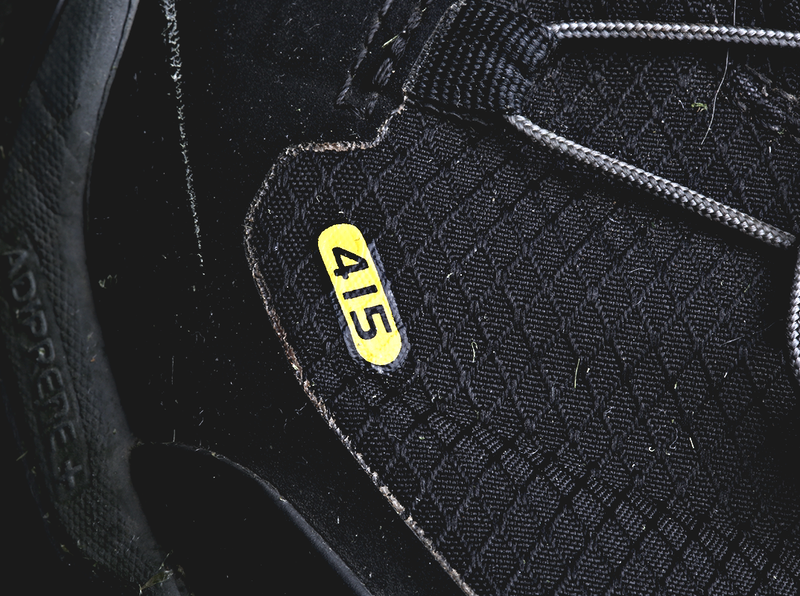 The yellow "415" sticker throws the whole appeal of the shoe off and while I do not care about aesthetics, yellow is a very weak color and I rather not wear anything that has it on it. I would highly recommend buying them if all you want out of a shoe is to run around and be active in. This is a good, comfortable shoe which will provide a lot of traction and has a pretty good shelf life. Most shoes have a maximum mileage they can cover and by the feel and lack of degradation of this shoe it appears to be just north of 500 miles, which is extremely good in terms of top tier running shoes. If you are looking for an EDC shoe, I would suggest looking elsewhere as the really poorly designed lace system sets you up for failure when you least expect it.